Tom Baker is the Doctor in Trail of the White Worm. For a Time Lord who has access to all of time and space thanks to the TARDIS, the Doctor and his companions sure end up in Great Britain more often than not. There’s a reason why the Death Zone of Gallifrey looks like the rocky and harsh countryside of Wales, and it’s not just because it’s the rocky and harsh countryside of Wales. Even with the location limitations placed upon them by the penny pinchers at the BBC, the writers, producers, and crew have always found a way to work within those confines. Filming at a typical English manor house, Day of the Daleks used time travel and predestination to strong effect, while Ghost Light took advantage of the manor house setting with a creepy tale about spirits. Costumes were used, reused, borrowed from, and swapped with other television productions. Friends and family, and sometimes crew, were put into scenes as extras. And, of course, there’s the possibly apocryphal story of Doctor Who filming in a quarry in Wales. The cast and crew heard an explosion from over a nearby hill. On the other side of the hill, to their surprise, another BBC science fiction was filming, none other than Blake’s 7! Constantly ending up in the United Kingdom in one way or another is part of the show’s charm. Wales, London, Scotland…Cardiff…Doctor Who has adapted, both with behind the scenes tricks of the trade as well as implanting and intertwining all things British with all things science fiction. 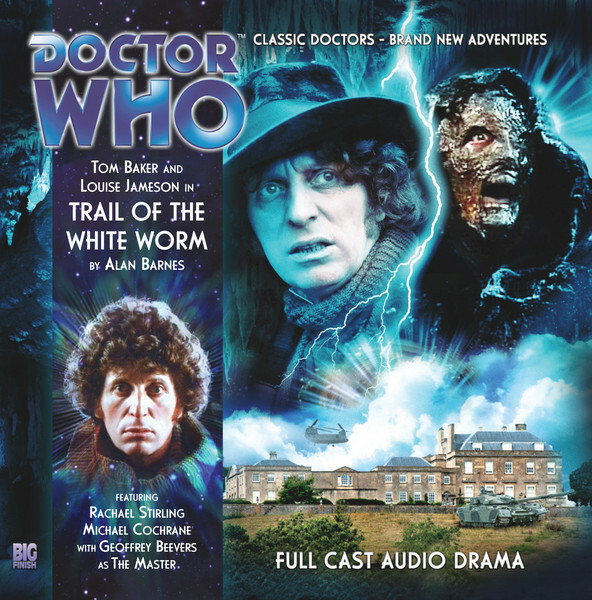 The Trail of the White Worm is the first episode in the two-part “season finale” that wraps up the first series of the Fourth Doctor Adventures. Playing off of a famous piece of folklore, the story finds the Doctor and Leela facing off against a heated foe over the fate of a fantastical creature. A solid story steeped in nostalgia, Trail suffers from being a bit uneven, a bit boring, and a bit underwhelming considering the people involved. Derbyshire, 1979. You don’t go to England during the summer without a good pair of gumboots, the Doctor tells Leela. But it doesn’t take long for the pair to be up to their waists in it, as a search party causes the pair to separate! As the Doctor becomes keenly interested in the search for the missing girl, Leela finds herself running for her life from a retired Colonel of the British Army! This Colonel, however, is under a new commanding officer, one who plans to use a legendary beast as part of his diabolical plan to conquer the Earth! The Lambton Worm is an old legend from Northeast England. A rebellious young nobleman named John Lambton catches a lamprey while fishing instead of attending church. He disposes of the lamprey by throwing it down a well before heading off to join the Crusades. While he’s going, the lamprey grows into a large white worm that poisons the well, destroys the local villages and farms, and leaves his family estate in ruins. Returning from the Crusades, Lambton fights and kills the worm, but at the cost of the next nine generations of Lambton patriarchs dying in a manner other than peacefully in their beds. Trail of the White Worm disposes of the curse and focuses on the core aspect of the Lambton Worm; big, white, lives underground, eats cows, sheep, and sometimes people. Trail strikes me as a tale that could have come from the pen of Robert Holmes (as opposed to Alan Barnes of Storm Warning and Neverland fame), in that you have a legendary/mythical/magical creature that turns out, and I don’t think I’m giving anything away by this, to be something much more fantastic and not of this world. Add the colorful secondary characters and “friendly but biting” banter between them, and Trail of the White Worm could have easily been filmed and produced for the Fourth Doctor’s television run. That said, the whole of Trail suffers from being the first episode in a two-episode story. Trail could have been a stand-alone story with the rewriting of the final three-to-five minutes, but as the cliffhanger MUST lead into the second episode, everything in those final minutes seems very rushed and jammed in. It’s a massive tonal and narrative shift from the other 50+ minutes, where things moved at a slower (but still brisk, as it’s a 60-minute story) pace. The climax is rushed, and the listener has a confused sense of “what just happened” before the final 30 seconds jam in enough exposition and action to set the tone for the second episode. The Oseidon Adventure is a different type of story than Trail of the White Worm; a military “race against the clock” as opposed to a “kidnapping/what’s in the house” tale. Tom Baker is the type of actor whose performance can either make a moderate script strong or make a moderate script weak. For this season of the Fourth Doctor Adventures, we have seen his sleepwalk through Destination: Nerva as well as absolutely crush it in The Renaissance Man. Trail of the White Worm sees the Doctor doing the “snooping around” bit for most of the episode’s run time, and then putting it all together in the final few minutes. Baker, as usual, is charming and quick witted. When he walks into Colonel Spindleton’s manor for the first time, he bellows “Hello! Anyone seen a savage?” He makes a comment about “which end is preferable” when he and Leela are swallowed by the White Worm as well. Baker’s charisma helps to carry the uneven script, but when he finally realizes just who exactly he’s dealing with, his reaction is subdued, and the listener doesn’t get the sense of malice that should accompany his presence. The script seperates the Doctor and Leela early on. One of the high points of Tom Baker’s return to the role has been his chemistry with Louise Jameson, but another high point has been the development of her character. The previous stories have established Leela as more than a savage, but Trail of the White Worm takes the opportunity to show her physical side. Her showdown with Spindleton’s tank and the plan she uses to “win” the fight made me clap my hands. Leela’s pride and joy in that moment were infectious. After that, we do get the standard “Leela yells at/threatens the villain” moments to close out the story, but they can be forgiven for the moment where Leela manages to outduel a freakin’ tank! The CD cover gives it away; after a nine-year hiatus, Geoffrey Beevers returns to the role of the Master for Big Finish. Easily the best parts of Dust Breeding and Master, hearing Beevers silky but harsh tones as he portrays the burned and scarred renegade Time Lord are pure joy. As usual, he adopts an alias, pretends to be helpful and willing to give “his” master everything he wants, until that moment where he turns the tables and shows his true colors. The drawback, sadly, is that the Master is barely IN this story! He plays a much larger role in The Oseidon Adventure, so it’s understandable why Barnes would hold him back a bit. But if you’re going to downplay the Master, your first episode cliffhanger MUST be nothing but “I am the Master, and you will obey me!” It’s a wasted chance that underlines the supporting role the Master plays in Trail of the White Worm. Alan Barnes once again gives us a strong supporting cast. Michael Cochrane plays retired Colonel Hugh Spindleton. Cochrane’s performances were the highlights of the Fifth Doctor serial Black Orchid and the Seventh Doctor serial Ghost Light. Spindleton wants nothing more than for Britain to get off her knees and get her Empire back, and he plays the “retired Great White Hunter” who thinks free milk for school kids is a “bad thing to the hilt.” He’s so over the top, he could see the other side, and Cochrane runs with it for all he’s worth. The teens played by John Banks and Becci Gemmell are the comic relief and tension breakers for the episode, and do their job well. Racahel Stirling finds herself doing the heavy lifting, though, as Demesne Furze, the mysterious old woman who has a connection to the White Worm. It’s tough to put a finger on her performance. She realizes what the Doctor is early on, a Time Lord, but switches back and forth between being menacing and threatening to pleading and cojoling, begging for his life when minutes earlier she was blackmailing him. It’s very jarring and knocks the listener a bit off-kilter. That’s the theme as a whole for Trail of the White Worm. The opening is very quick and intense, then we have a long middle section of running around and investigating, and then a large amount of exposition and action jammed into the final scene before the last 30 seconds of the story radically change the tone. It’s one of the drawbacks for the hour-long format, and while there are some solid moments within the serial, in the end it rushes everything together and almost renders the entirety of Trail of the White Worm as nothing more than a McGuffin to lead into the season finale. Synopsis – A throwback to Robert Holmes, Trail of the White Worm suffers from alternately rushing about and taking its time before jamming everything into the final minutes. 3/5. Tom Baker is the Doctor in…The Oseidon Adventure. This entry was posted in Big Finish Review and tagged 3/5, Big Finish, Doctor Who, Fourth Doctor, Leela, Louise Jameson, TARDIS, the Master, Tom Baker. Bookmark the permalink.